Simeon Tochukwu Nwankwo is in the form of his life and Crotone are reaping the benefits, with the Nigeria national-teamer contributing to 10 goals in his last six appearances in the Italian Serie B. By netting a brace against Carpi last weekend, Simy took his tally to seven goals in 2019, exceeding his achievements in the second half of last season which made him earn a maiden call-up to the Super Eagles ahead of the 2018 World Cup. Simy's contract with Crotone is set to run out at the end of the 2018-2019 season and he has been linked with a couple of clubs in Europe, with Lazio his latest suitor. While former Watford star Odion Ighalo is guaranteed a spot on the Super Eagles 2019 Africa Cup of Nations roster, there are still positions up for grabs and Simy believes he's in contention to be on the plane to Egypt. 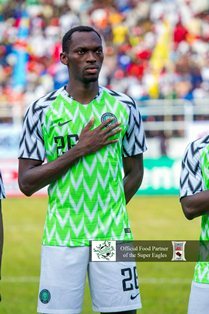 ''It is always a dream playing for the Super Eagles but for that to happen I have to focus on doing well for my club so that's what I am focused on doing now,'' he concluded. The former Gil Vicente FC man featured in two matches off the bench during the 2018 World Cup and was on target in an unofficial game against Liberia in September 2018.